Mark your calendars for July 17-19, 2015, when San Diego LGBT Pride rolls out its annual mile-long parade in the heart of Hillcrest followed by a two-day music festival held within the idyllic setting of Balboa Park. The organization recently released its artist lineup for the festival (see below), which carries wide appeal to the thousands of visitors Pride receives each year. Reflecting on the first LGBT rally held here in 1975, this free kick-off event shines a spotlight on the community’s achievements and current challenges. It’s a time when LGBT leaders of local and national origins take the stage and energize the crowd with their calls for equality. A high-energy music stage combines with dancing and outdoor bars at this well-attended bash, which is held for those 21 years and older. During the first hour, complimentary cocktails will be available for the first 300 guests. 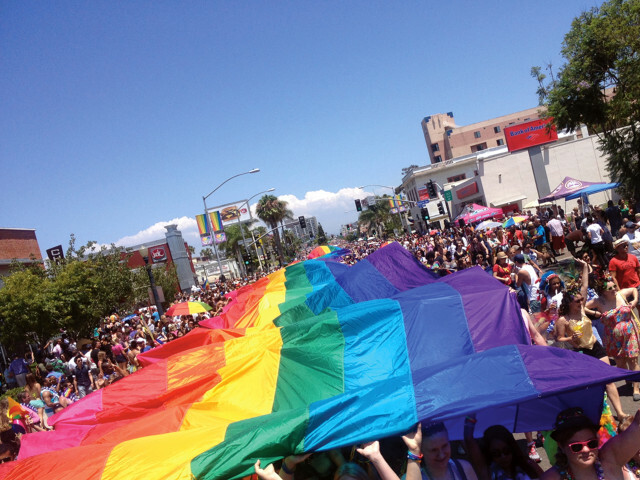 The annual Pride parade ranks as San Diego’s largest civic event, attracting more than 100,000 spectators each year. The mile-long procession, replete with uniformed service members, dramatic floats and dancing troupes, continues west on University Avenue before turning south on Sixth Avenue. It rarely ever rains on this parade, so bring lots of sunscreen. Visitors to the two-day festival can expect five performance stages and more than 200 exhibitor booths offering information, services and unique products. The grounds also give way to a Youth Zone (for ages 14 to 18) as well an open-air art gallery and areas for enjoying beer, cocktails and a variety of foods. The huge entertainment lineup features a non-stop mix of live dance, pop, Latin and hip-hop music, all enjoyed on the park’s grassy lawns. Among the highlights are: Emma Hewitt, Late Night Alumni, Mary Lambert and Rocio Banquells, not to mention Carmen Electra hosting the main stage on the festival’s first day. The program also includes the San Diego Gay Men’s and Woman Choruses plus an Elton John tribute by Kenny Metcalf.